Your 1st step is to reach out! Either give us a call or fill out our service inquiry form. During our initial conversation, we will listen to your concerns and reasons for seeking out our services and what you are hoping to achieve. We can then set up a free* in-home consultation. At the consultation, you can tell us more details about your problems, show us the area(s) you would like help with and give us a little more insight about who you are and how you are hoping to make your home function better. We will discuss your service options and develop a time and action plan. 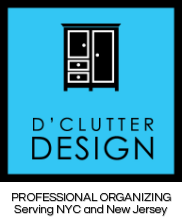 D'Clutter Design looks forward to helping you! Do you wish your home had a little more style? Sometimes it’s not about buying something new but working with what you’ve got. We will assess your current space and furnishings to suggest and develop a plan to reorganize your areas to be both functional and fashionable. We will also be happy to accompany you on a mini-home makeover shopping spree. Do you spend more time looking for something than actually wearing or using it? ​​No matter how large our homes are, we always think we need more space. We will assess your closets and cabinets and design a plan to increase your storage and create a personalized organization system. We will work together to purge, organize and design the perfect spaces to fit all your possessions! Are you “over the moon” excited about your new home but 100% stressed out? There is so much to plan and execute that many people get overwhelmed with the process of moving. D’Clutter Design can manage the packing process by helping you declutter and organize for your move, pack up your possessions and create a labeling and master packing list. We can also be there when you arrive at your new house to help you unpack and set-up. We will make it feel like a home in no time! Are you getting ready to sell? Are you looking to downsize? Do you have an elderly family member moving into a smaller home? We’d be happy to offer our expertise and after assessing your home, put together a plan of action to guide you on your own quest to a fashionably functional home. Do you know someone who'd benefit from our services? Give them a D'Clutter Design gift certificate! We offer gift certificates in many denominations.